It is over 450 pages 8.5 x 11. New Testament verses are on the left. Old Testament verses are on the right. One reads a certain New Testament verse finding an Old Testament verse or verses on the right. 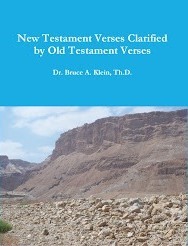 All Old Testament verses when quoted in the New Testament are given. It is a great reference when writing Bible studies and sermons! Thank you for posting my latest book. I use this book personally, often. It has every Old Testament quote found in the New Testament listed, plus many allusions, and O.T. explanations for a verse. It has 454 pages, 8.5 x 11. The New Testament is on the left; the Old Testament is on the right. The Old Testament is my schoolmaster.